Seeing as though I tend to make a lot of extra breakfast foods on the weekends, I like to freeze them in individual bags for easy weekday breakfasts. So, the FoodSaver has really come in handy for that! It really is a great idea for people who have an extra freezer at their house. Wishing I was one of them! So let’s talk about how it works. The FoodSaver has a place inside the machine to store your roll of plastic (which is a special FoodSaver product) and cutter to measure just the right amount for your food. You cut a piece of the plastic bagging that is at least 4 inches longer than the food that you’ll put inside the bag. Using the seal button, seal one end of the bag, place the food in the bag and use seal and vacuum the other end of the bag. The buttons are pretty self explanatory, too. Initially, I was concerned about the waste the bags would be if I could only use them once, but if you’re careful how you cut you can take what you need out of the bag after it’s been frozen and just re-vacuum and seal up the remaining food. You can also cut off of the sealed end and wash and air dry the bag and use it again. Sounds good to me! I wish I was all coupon-queen and stocking up on fresh meats and vegetables that I could store in the freezer for a rainy day, but I’m just not that good. However, I hope that some day we’ll have a large enough garden to where we can harvest enough food to freeze for the off season. And I guess we’ll have to invest in that extra freezer then too, eh? 😉 Oh, and with veggies, you may as well grab some of the FoodSavor Freeze ‘n Steam bags so that all you have to do is pop them in the microwave from the freezer, just like you do with the steam-in-bag frozen vegetables from the grocery store! Perfectly portioned meals like this. Any sort of bread or pastry. Make a double batch of a crock pot meal. Extra meatballs for this delightful meal. I haven’t tried it yet, but another cool feature is the quick marinator accessory (that plastic container on the left) that marinates meats and vegetables in minutes rather than hours. Sweet! Unfortunately, I don’t freeze food on a regular enough basis to give me an excuse to make the FoodSaver easily accessible to me since it is so big and heavy. I’m guessing it weighs at least 5 pounds and is at least 1 foot in length. I just don’t have the cabinet space to house it for regular use. For now, it has a lovely little home in my laundry closet until I make an exception to go FoodSaver-bag-crazy and stock up my freezer. I will say, over my time as a married woman, I have thrown out too many pieces of freezer-burnt bread (yes, I freeze my bread. It lasts longer!). It would have been nice to not have to worry about that. Like I said, I’m not sure if I would personally buy one since I don’t have an extra freezer and don’t tend to stock up when things go on sale. 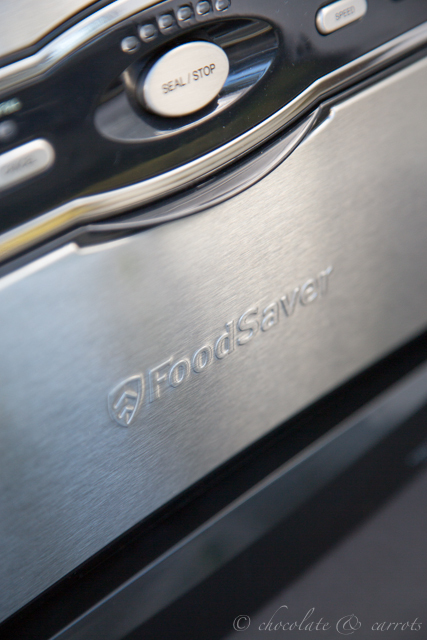 However, if I did want to take the extra time to coupon and look for sales (which I totally should do more than I already do), the FoodSaver would be a good investment. No purchase necessary to enter. Prizes will only be shipped within the United States. Winner will be selected at random by rafflecopter using Random.org. All entries received after the giveaway closing day and time will not be considered. Entries that do not follow the entry requirements will not be considered. Winners will be notified via email and will have 24 hours to confirm receipt of the email. If the winners do not reply within 24 hours, another winner(s) will be selected. Giveaways will be mailed to the winners’ address. This giveaway has been sponsored by Food Saver. 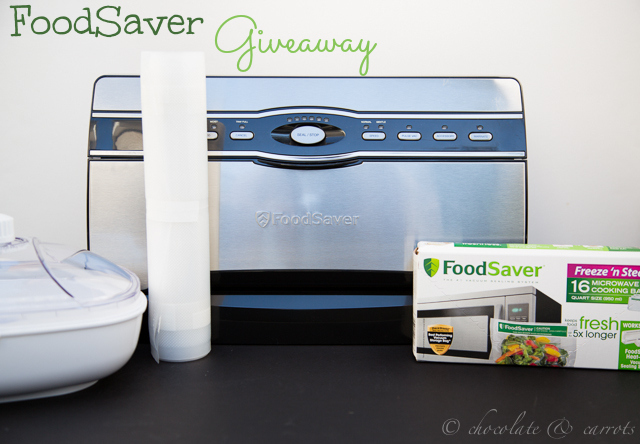 I received a FoodSaver system to review for this post. All opinions stated are my own. I live by myself, so I always have leftovers. This would be great for me, especially with meat! Fresh fruit when its season! Oh, I would freeze bread. That would be so useful! I’d chop onions and freeze them! Soups and chili – then I can clean out my storage containers! I would freeze fresh veggies and fruit over the summer when they are fresher. I’d also use it to make meals in advance and freeze them. I love chicken, and when it’s on sale I want to buy all the bags, but if I had a food saver the first thing I would freeze would be chicken. I would use it to freeze different kinds of meat. I like to buy in bulk when it’s on sale. I would freeze all the meat I buy in bulk! We freeze a lot of fresh fruit, and veggies! this would be a really handy way to do that! We buy meats in bulk and always make double portions for leftovers. Also have a new baby!! Would love the foodsaver. Thanks for the giveaway! I’d freeze brownies so I don’t eat them all at the same time! I buy large packages of chicken and pork and portion them out for the freezer – so that’s what I would freeze first. I’d start buying meat in bulk…then I could portion it out for my husband and I. The many herbs that we have growing (and doing great despite the outside weather) in my enclosed back porch. Then the Sky is the Limit. We buy our meat in bulk and I would totally use it to freeze our meats. Oh and we freeze our bread too! We make it homemade and freeze a loaf a week! Ooh, my in-laws have one of these and LOVE it. I’ve been thinking about getting one! I think i’d start by making some soups/stews/chilis + freezing those – they always make for great freezer meals! I would make pulled pork and freeze leftovers. i would freeze challah bread for french toast! Bread and rolls! My husband likes sandwiches on rolls for his lunches and it’s so hard to keep them fresh! I buy lots of things in bulk, especially chicken, so this would be great for freezing it in portions. I’d freeze meat that I buy in bulk at Costco, veggies from the garden in the summer and fresh berries/rhubarb, etc. I could put a foodsaver to good use. Thanks for offering the giveaway. I would freeze dishes (like enchiladas, etc.) which I’ll be starting to make soon before the arrival of our baby in May! I would first use the food saver for corned beef then I would use it alaska salmon for the upcoming season. I would buy in bulk and freeze chicken breasts. Since it’s currently just me for the next 6 months… I think I would freeze up some green smoothie packs. Boneless chicken breasts – we always have a ton of them in the freezer. I’d freeze all my breads. I shop at Sams a lot.. so I would freeze meats! I would freeze meat. I love getting a good deal and stocking up! I would freeze vegetables from the farmer’s market. My husband loves my chicken enchiladas so I would make a really big batch and freeze them individually so he could have them whenever a craving strikes! All the chicken I buy! and cookie dough! I would freeze pre-made meals for easy dinners!! This would be a fantastic way to store my beef jerky! I would freeze my bread. I would freeze bread/rolls! And meat since I have four kids (three of them boys) I go through tons of meat and always purchase it in bulk. I buy 2-lb. blocks of cheddar at Costco, cut them into quarters, vacuum-seal and freeze three and put one in the fridge. Also blanched chard and kale from the garden in 2-cup amounts. Meat, bread, cheese, veggies, fruit, everything! I would freeze baby food! Can’t wait to try out all of your recipes! Thanks! I would definitely freeze meat first. Meat is so expensive and I hate when any of it goes to waste from sitting in the freezer too long. I would also love to freeze meals to have on hand when I don’t have much time to cook. I would probably freeze whatever fruit is in season at the Farmer’s Market. Strawberries and blueberries from the local farm! I would freeze veggies from my CSA and cookie dough! So excited to try the FoodSaver! Thank you for a fantastic giveaway.